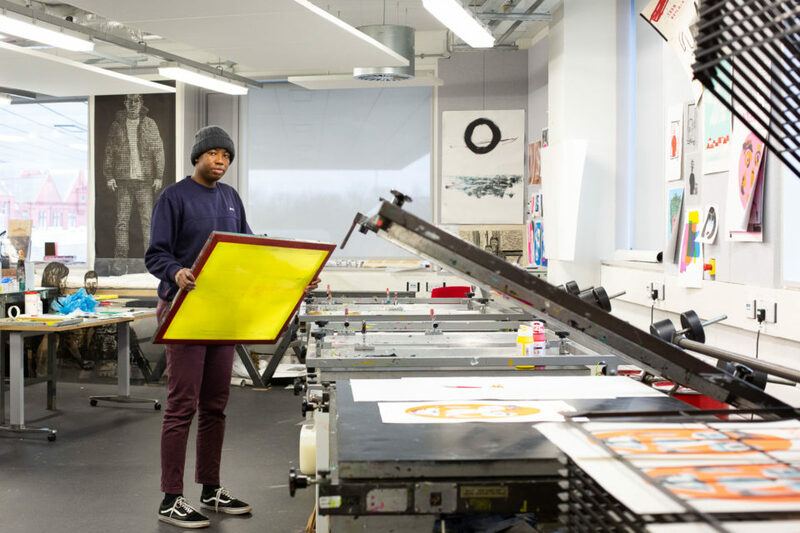 Chebo is a third year Graphic Design student. What’s it like here Chebo? It’s not like college, with the structured desks and seating plans. It’s flexible here. They move the areas and furniture around depending on what’s going to happen. What do you like about the spaces? Since it’s so open, it’s really easy to see if the tutors are free. Most of the time they’re either in here doing lectures or they’re walking around. So if you need help, you can just grab them. Have the open spaces had any impact on your work? Seeing how fashion students work and how they’ve displayed their work has been really beneficial. I soak it up visually then it informs my presentation and ways of working. With one of my projects, I lent on fashion techniques like embroidery and borrowed from their skill set and resources. And do you socialise much here? Most days there will be opportunity to socialise. They installed the ping pong table so it’s somewhere people can relax as well as work. How do you feel when you’re in the building? Inspired. It’s a great place to learn new techniques and develop and refine my skills.